Yes, I hear you, Amy. What is it this time? You're bored again? The lady of the house has you baking? And you're sick of it? You'd rather go shopping in the city? Well, first of all, let's see what you baked. 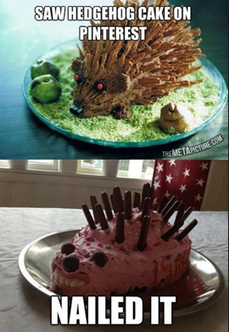 I don't know how well your hedgehog cake went over in the 19th century, but it looks, um, edible at least. Okay, before you take off to the city, just so you know - here's what a city in the eighteen hundreds doesn't look like. First of all, you certainly can't travel to the city alone in the 19th century. It would be considered totally unacceptable. Ohh, you've got someone to go with you. The spinster aunt who lives in the house? She wants to go too? Okay then, let me prepare you a bit so you won't freak out when you get there. The buildings will be no more than a few storeys in height. There will be no elevators. Offices, shops, taverns, a theatre and a hotel will line the main street. You will see gas street lamps along the sides of the road as these started to appear in cities in 1841. The main street will probably be paved. There may be quite a lot of people in the centre of the city - it is considered a trendy place to live, similar to the 21st century. The population of the city will be around 56,000 people. You will also see stately churches with tall steeples and large markets for the purchasing of food. Along the harbour, rail lines will dominate the waterfront and you will be able to see the first train station ever built in the downtown area. Near it will be City Hall. You will see horses, buggies and stagecoaches on the main street. At the turn of the 19th century, the Industrial Revolution (we should also discuss this sometime) brought with it prosperity and an affluent middle class. Women became the primary shoppers of their households. The first true department store opened in Paris in 1838. It was called Bon Marché and offered a large selection of goods in "departments" inside one building. In New York City during 1846, Alexander Turney Stewart named his department store, the Marble Palace, offering European merchandise. And in 1858, Rowland Hussey founded the ever popular Macy's. In Canada, the Hudson's Bay Company was the first store to include distinct departments in the mid-1800s, selling everything from furs to housewares. By the late 1800s, department stores will hold a solid place in the world. Smaller stores found in towns will grow in size to match their increasing population, eventually requiring their own department stores as they evolve into cities. There will be one of these department stores when you arrive in the city, Amy. Maybe you and spinster aunt will decide to go to the theatre as well, perhaps to see a Shakespearean play.